Calculating the expiration date of a U.S. Utility Patent is not particularly difficult, but it can be confusing — so confusing in fact that the U.S. Government occasionally blows it — see U.S. Patent No. 7,604,811, which issued long after it expired. 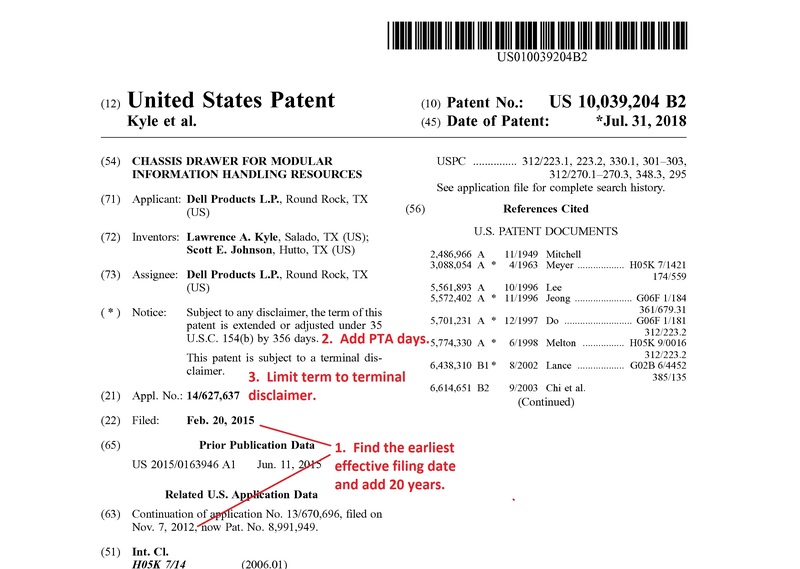 For patent issuing from applications filed before June 8, 1995, the term is the longer of 17 years from issue, or 20 years form its earliest effective filing date (pursuant to 35 USC 154(a)(2)). That’s more than 20 years ago — who cares? Applications filed before June 8, 1995, are still pending. U.S. Patent No. 10,016,914 on Positive Displacement Molding of Plastic Parts issued on July 10, 2018, and five such patents issued in 2017. Although rare, it is still a possibility that must be taken into account. Subject to the payment of fees under this title, such grant shall be for a term beginning on the date on which the patent issues and ending 20 years from the date on which the application for the patent was filed in the United States or, if the application contains a specific reference to an earlier filed application or applications under section 120, 121, or 365(c) of this title, from the date on which the earliest such application was filed. Simply stated, you take the earliest effective filing for the patent (other than a provisional application filing date or a foreign filing date and add 20 years. However three adjustments must be considered. First, patent term adjustment (PTA) under 35 USC 154(b) may extend the term because of Patent Office delays in examining and issuing the patent. Second, patent term extension (PTE) under 35 USC 156 may extend the term because of regulatory delays in clearing the subject matter of the patent. Third, and finally, the term of the patent is subject to any terminal disclaimers made (to avoid double patenting rejections). Terminal disclaimers are usually, but not always, indicated on the first page of the patent, but the file wrapper should always be consulted (1) to identify any terminal disclaimers not reflected on the first page, and (2) determine the effect of the terminal disclaimer. This entry was posted in Term by bwheelock. Bookmark the permalink.